Due to user complaints, Opera, one of the leading web browser company, rolled out the feature to block pop-up windows in its browser. Later on, Mozilla, the Internet Explorer and other browser companies adopted this feature, in order to facilitate the users. Today, we bring for all you WordPress bloggers a ‘How To’ trick which makes the Pop-up window “Unblockable”. This new generation of popup window can’t be blocked by the browser’s popup blocking feature. This technique can either be used to display a message for your visitors, such as a giveaway pop-up or used to display an image. This type of popup is mostly used to remind your readers to subscribe to your RSS feed or follow you on the various social networks such as Twitter, Facebook, LinkedIn, etc. WP Super Popup is one of the best plugin available for WordPress bloggers. You can install this plugin by going to the “plugins” menu in the WordPress Dashboard and type in the search pane “Super popup”. Install the WP Super Popup Plugin after which you can activate it. 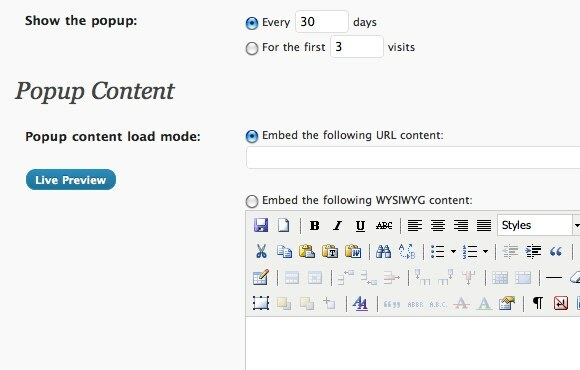 The plugin will create its own settings menu on the WordPress sidebar. Inside the settings, locate the “base settings”, from where you can enable/disable the plugin and choose a variety of settings including the placement of the popup. Furthermore, you can add intervals to the page content by adding a URL. 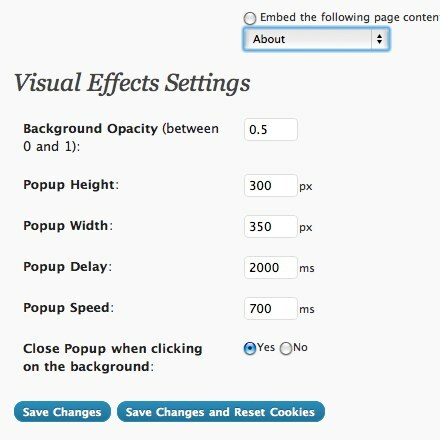 Visual Effect Settings lets your popup blend with your page. You can easily set the height, width as well as Background Opacity to set things up.